The World Metrology Day poster 2010 shows a photo of the Great Belt east bridge (Storebæltsbroen), Denmark. Each of the east bridge’s 55 prefabricated 48-metre, 500-ton bridge sections were measured in detail in order to adjust the four hangers which carry the section, to ensure the correct tension. The measured, and expected, deviations from the theoretical measurements required a hanger adjustment of ± 30 mm. The adjustment of each hanger pin was determined to an accuracy of ± 1 mm. A wide network of contractors and subcontractors from 10 European countries were involved in building the bridge 1988 - 1997. Reliable and verified measurements were essential in this huge and complex collaboration. During the 1990s, inspired by the ”Junior Woodchucks Guidebook”, where Huey, Dewey, and Louie (Donald Duck's nephews) found the answers to all questions, Dr. Kim Carneiro from DFM wanted to make such a handbook for metrology. However, it was only when Preben Howarth joined DFM as the first non-metrologist, that they managed to make it. At that time, the Great Belt bridge was being constructed and it was the first time that laser-based length measurements were applied on a large scale in Denmark. It was also an symbol of bridge-building and collaboration that put the two halves of Denmark together and changed the life of every Dane. The first issue “Metrologi – kort og godt” has on its cover a picture of the unfinished bridge, signifying the build up also of Danish metrology. 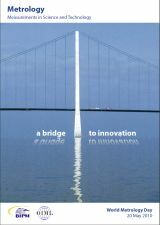 When the first English version of the booklet (Metrology in Short) was published by DFM, the cover picture was of the now finished bridge; and in 2008 DFM transferred the copyright of the booklet to the newly formed EURAMET e.V. The last edition of the booklet can be downloaded from the EURAMET website.